We love Alfredo Sauce in this home! I am going to share with you the recipe I use to make it. Melt butter in a medium sauce pan over medium heat. Add cream cheese and garlic powder and stir until smooth. Add milk a little at a time, whisking to smooth out lumps. Stir in Parmesan cheese and pepper. Remove from heat when sauce reaches desired consistency. Sauce will thicken rapidly. Add more milk to thin if sauce gets to thick. Pour on your pasta and enjoy! sounds delicious. 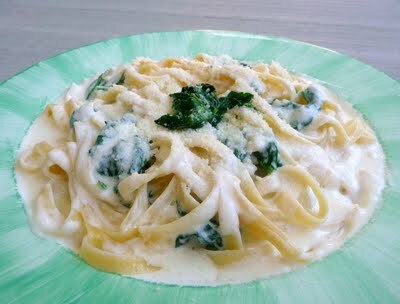 :) I love this creamy and comforting sauce! Happy 4th of July to you and your family. Your blog is making me so hungry. I'm so following!! How many do you think this serves? Loved this recipe. So yummy and rich. The kids loved it. I love Pinterest. Every recipe I've made from there has been delicious and there's always a great picture!! Do you use grated parm or fresh? I typically use grated park because it blend better, but I am sure fresh would be just fine too.